Alcohol based hand washes are effective at killing bacteria, the same goes for soap and water if you have time. But after discovering that a large number of nurses and practitioners were reporting skin problems due to repeated use of alcohol on their hands, we set out to make a natural anti-bacterial cleanser that protected the skin, whilst being as effective as alcohol in a time kill study. Espress-o Yourself! Caffeine is great for your skin. So we have used finely ground fresh, virgin coffee meaning your skin gets all the caffeine! This gently buffs away dead skin cells creating a blank canvas for your moisturising routine. We wanted to improve on the average coffee scrub, that is why it took us so long to get it right. We added two super effective moisturising oils to the coffee, Squalane and Olive Oil. We also added Natural Vitamin and a little honey. As well as moisturising, these ingredients soften the coffee and smooth off the edges of the grains. This helps make the formula gentle enough to use on your face, but still tough enough to smooth out the less delicate parts of your body! We then added some natural antibacterials. Scoop out desired amount and mix with a little bit of water. Massage on the skin in a circular motion. You will be getting a bit brown and dirty (its coffee!) but the result are worth it. Rinse off, dry off and moisturise. We suggest the Full Cream or MSM. (Not upselling we promise! It iis just what we love! after this). Check out just how soft your skin is. Notice the total absence of any word-plays about getting dirty in the shower? It wasn't easy. Fresh Virgin Ground Coffee Beans There is the option to use used coffee grinds here. But when we experimented among ourselves, we found fresh, finely ground virgin coffee felt so much better afterwards. Cocos Nucifera (Coconut) Oil Raw Coconut Oil smooths the coffee grinds as well as leaving a the skin soft and moist. One of our favourite moisturising oils. It helps leave your skin moisturised and dewy. It is good for all skin types, including acne prone skin. Olive squalane's composition is very similar to human sebum, it can penetrate our skin very quickly to help our skin to fight dryness. It enhances skin elasticity and moisture retention. Mel (Honey) Honey is great for the skin and a natural anti-bacterial. Tocopherol (Natural Vitamin E) We use the more expensive, natural Vitamin E Natural Vitamin E has up to twice the bioavailability of synthetic forms. Vitamin E has antioxidant action as well as free radical scavenger properties. P Ansic Acid (Natural Preservative) This Anise derived preservative system from the basil plant, is antimicrobial and skin softening. Glyceryl Caprylate (Germ Killer) Glyceryl Caprylate has an excellent efficacy against bacteria and yeast and as such makes a great natural preservative for skin care. 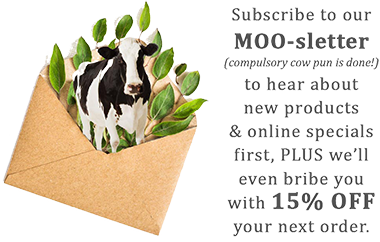 Follow MooGoo for the most up-to-date product news, offers and customer stories! Copyright © 2019 MooGoo, All Rights Reserved. Stay up-to-date with the happenings of the Herd!